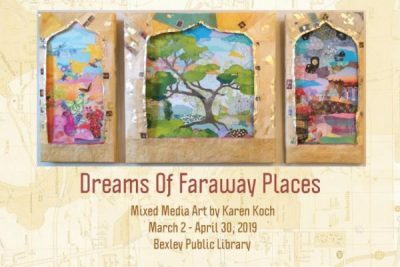 Dreams of Faraway Places, Mixed Media Art by Karen Koch March 2 – April 30 Meet the artist: April 7, 2:00-4:00 Bexley Public Library, Bexley, Ohio Art, like literature, can create beautiful worlds or transport us to distant destinations. In the exhibit, “Dreams of Faraway Places”, Karen Koch creates colorful art that tells stories of places we love, both real and imagined. Her art leads you from the forests of Oregon to Canal du Midi in France to the center of New Orleans. Along the route are imaginary gardens, waterfalls, tropical coves, and southwest mesas. 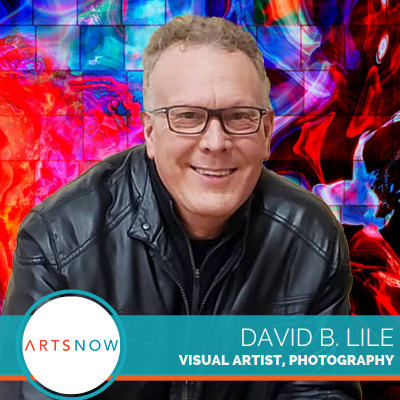 The artist creates rich, textured work using paint, paper, thread, buttons, plastic, and much more. You will spot old dictionaries, encyclopedias, textbooks, and roadmaps in many of the artworks. She loves taking items that have outlived their usefulness and giving them a second chance at life in her art. 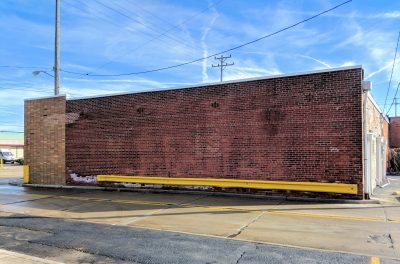 PLAYWRIGHTS LOCAL Announces its 2019 OPEN SUBMISSION PERIOD New ten-minute, one-act, full-length, and radio plays by writers from Northeast Ohio accepted from January 1 – April 30, 2019. No fee for submitting! Playwrights Local seeks original, unproduced plays for our 2019-2020 season and events, including: Staged readings of plays of all lengths in our annual Cleveland Playwrights Festival; Development of full-lengths in our Play Lab program; Readings of one-acts and full-lengths in our Roundtable workshop; Production of audio plays in our PodPlay series; Consideration of full-lengths for production in our 2020-2021 season. 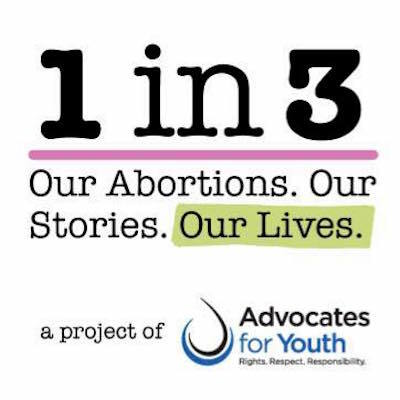 Playwrights may submit up to three pieces (1 per form): One ten-minute play (10 pages or less) One one-act (30-60 pages) or full-length play (60-120 pages) One radio/podcast play (25-60 pages) All unproduced, original plays for adult audiences are accepted, including one-person plays. 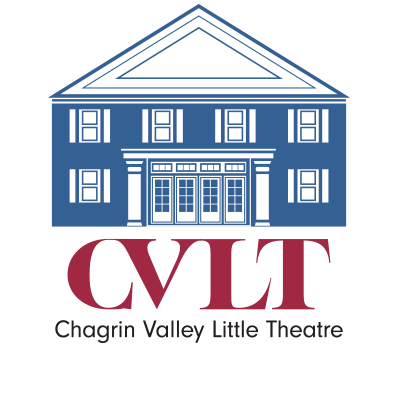 (Not accepted: children’s plays, musicals, adaptations of copyrighted material, and translations.) Find more information at http://playwrightslocal.org/submissions/. NO SUBMISSION FEE Open to all playwrights age 18 or older who are permanent residents of any county in Northeast Ohio. Submissions open at 12:01am on January 1, 2019, and close at midnight on April 30, 2019. Early submissions are encouraged. Selections will be announced by August 31, 2019. For guidelines and additional information, see http://playwrightslocal.org/submissions/. 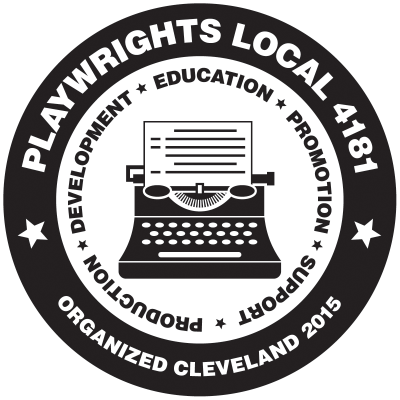 ABOUT US Playwrights Local is a 501(c)(3) theater company based in Cleveland. As a playwrights’ center, our goal is to provide a home base for all novice and experienced dramatic writers in Northeast Ohio—that is, to serve as a creative outlet for anyone interested in writing for the stage and screen. 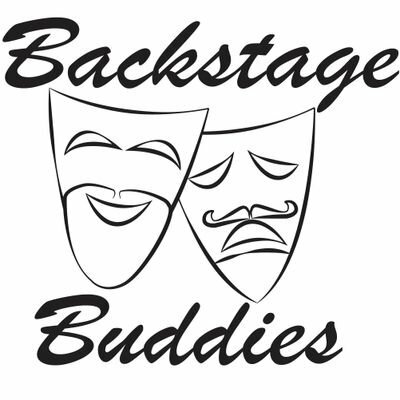 We offer free classes, produce original plays, provide networking opportunities, and engage the community through outreach projects. 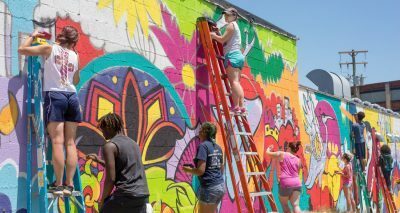 Playwrights Local strives to increase the impact of original theater on the community and to raise the profile of area playwrights both within Greater Cleveland and beyond. The Craft Emergency Relief Fund is a national nonprofit organization that provides small grants of up to $3,000 to professional craftspeople who have experienced a recent career-threatening emergency such as illness, accident, fire, or natural disaster. 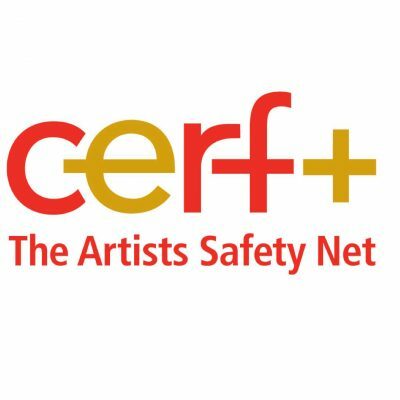 (Other services provided by the organization include referrals to craft suppliers who have agreed to offer discounts on materials and equipment to craftspeople eligible for CERF funds, and booth fee waivers in partnership with certain craft show producers.) 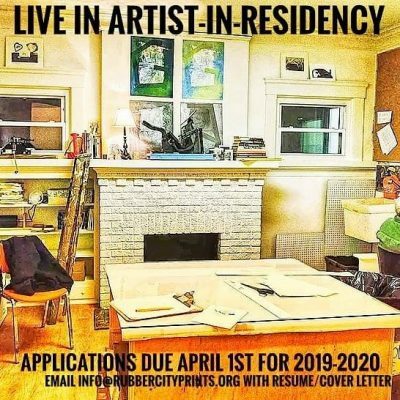 Applicants must be a professional artist working in a craft discipline (e.g., woodworkers, fiber artists, metalsmiths, glass artists, potters, and furniture makers) who has suffered a recent career-threatening emergency and is a legal resident of the United States. To embody our commitment to developing new work by local voices, Stow Players is launching The Emerging Playwright Reading Series (EPRS). EPRS is a new play development program, minimally staged with actors carrying scripts, allowing the audience to assist the playwright in fulfilling the play’s full potential. The Emerging Playwright Reading Series will take place on various evenings throughout Stow Players’ season as schedules allow. The playwright, director and actors will have access to the theater the day prior to the audience presentation to ensure all technical needs can be met. 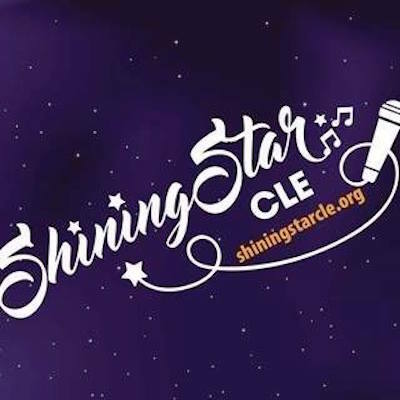 Unless otherwise noted, all performances begin at 8:00 pm and take place at: Stow Players 5238 Young Rd Stow, Ohio 44224 SUBMISSION ELIGIBILITY EPRS is open to playwrights who currently live within 3 hours of Stow, Ohio and are willing to travel to Stow Players for the Staged Reading. Submissions can be less than full length (~90 minutes). However, if submissions are not full length, they may be combined with other shorter scripts for one evening of staged reading and talk back. This can result in an undetermined delay in the Staged Reading taking place. Submissions must not have received a full production. Submissions that have received full productions, even if they have undergone significant post-production revisions, will not be considered. TO SUBMIT Send an email to StowPlayers@gmail.com with the following information: NAME: EMAIL: PHONE: ADDRESS: BIO: (250 words of less, please. Try to dazzle us) PLAY TITLE: # OF CHARACTERS: (6 or under) SYNOPSIS: (In 250 words or less, tell us about your script) Attach script(s) as a .pdf (how to create). We believe in a blind selection process so only include the title and page numbers on the script itself. No identifying information, please. FAQs How many scripts will be chosen? A. That depends on how many scripts are submitted and when the performance space can be made available. When can I expect to be notificed if my script is chosen? A. Scripts will be read by at least two different people then passed along to our Production Committee for scheduling. We know what it’s like to be kept waiting, so we’ll do our best to shorten our process. When will my Reading take place? 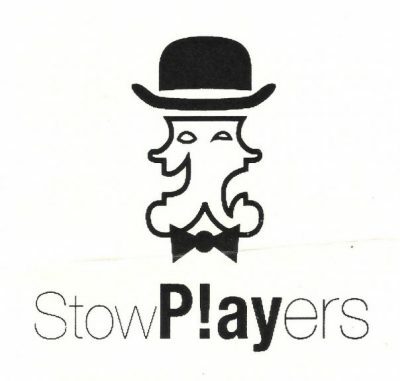 A. Stow Players’ season is from the end of October through the end of March. All staged readings will take place during that time. Where about Actors and a Director? A. If you have a Director and/or Actors in mind, please provide that information when submitting your script. If not, Stow Players will provide them for you. If you choose the latter approach, these choices will be at our discretion and you, the playwright, will have no veto power.